-----For us, this was the first leg of Le Grand Circuit Nautique -- 800 nautical miles of scenic waterway that encircles northeastern New York and southern Ontario. 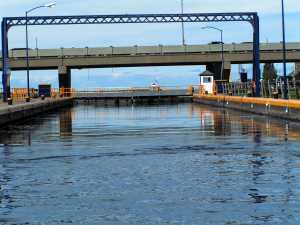 The Oswego Canal, 24 miles long, connects the Erie Canal near Syracuse with Lake Ontario. It traverses not only interesting geography but fascinating history. -----From the earliest days of human habitation of this region, the Oswego River was a major transportation route. With the arrival of Europeans in New York, the river was a connection from the east coast to the Great Lakes and the Midwest. But it wasn't a direct route! From New York City, goods were transported by bateaux (small flat-bottomed boats) up the Hudson River, west on the Mohawk River, through the Utica-Rome Canal, west on Wood Creek, across Oneida Lake, west on the Oneida River, and finally north on the Oswego River. Everything was portaged around the Three River Rift at Phoenix and Oswego Falls in Fulton. Finally the goods were carried north to Lake Ontario. 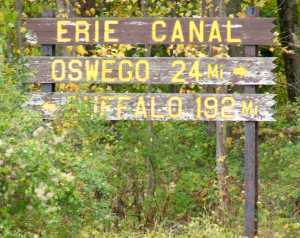 -----When work began on the Erie Canal in 1817, people living along the Oswego River were by-passed by the canal. They could see that the only way they could maintain productive communities was to lobby for an Oswego Branch of the Erie Canal. In 1825, the year the Erie was completed, $160,000 was authorized by the state to build the Oswego Canal. 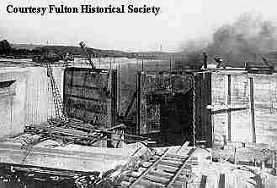 On July 4, 1826 the cornerstone of the first lock was put in place in Fulton and two years later the canal opened. -----As the Erie was being built, people in the communities along the Oswego River wanted to make sure that it remained an important and well-used waterway. In many cases, livelihoods and businesses depended on it. They lobbied for moneys to have an Oswego branch of the Erie Canal constructed. In 1825, the same year that the Erie Canal was completed, $160,000 was authorized by the state to build the Oswego Canal. 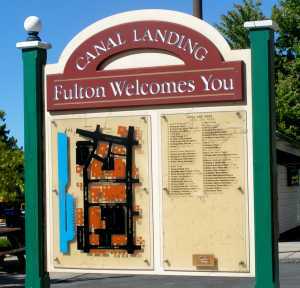 On July 4, 1826, the cornerstone of the first lock in the Oswego Canal was put in place in Fulton. The canal opened two years later. ---- The Oswego Canal extension was completed from Three Rivers, west of Syracuse, by canalizing the north-flowing Oswego River. The canal was eventually dredged to a depth of 14 feet and finally had seven locks to drop boats 118 feet to Lake Ontario. It quickly became one of America's most economically successful canals, second only to the Erie, by transporting goods from the Great Lakes to New York's inland or Atlantic coastal cities. -----1. There is no lock #4. And why not? The original plans for the Barge Canal did include a Lock 4, but as construction progressed, engineers determined the lock wasn't needed. At that time, all of the plans and diagrams were done by hand; it was simpler to leave out the lock, than re-label the others. 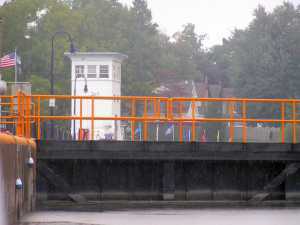 The situation isn't unique to the Oswego Canal - the Champlain is missing Lock 10, and the Erie has no Lock 31. -----2. There is a shift of buoy colors at Three Rivers. Red marks are to the east and green to west in the Oswego Canal. -----The Seneca and Oneida Rivers meet at Three Rivers Point to form the Oswego River - the junction, today, of the Oswego Canal and the Erie. As often happens with river junctions, this site has an important history. For thousands of years, Native Americans used the site as a meeting place. During historic time this was the homeland of the Onondaga Indians. My great-great-great-great grandfather, Christian Herrick Fiero, camped at the junction almost 250 years ago. It was 1758 and he was a member of the Ulster New York Militia. Under British Colonel John Bradstreet, the 228 men of the Ulster militia was part of a British Army of 3,000 troops. It was the time of incredible struggle between the French and the English over the control of the North American continent, now known as the French and Indian War. The British army camped at the junction in that long ago summer, en route to lay siege to Fort Frontenac, the French fort near Kingston, Ontario that controlled the western end of the St. Lawrence River and access to the Great Lakes. The fort was the main base of supplies for French forces in the continental interior. The British, with the help of my ancestor, captured the fort in August. This action cut French supply lines to their settlements to the west and gave the British control of the western portion of the St. Lawrence River. Christian Herrick Fiero returned to his farm in the Hudson Valley. -----A year later, the British built a small fort at Three Rivers to protect a storehouse of ammunition and provisions used to supply the British military for an attack on Montreal, the last battle of the war. -----Almost twenty years later, in August of 1777, another British force, composed mostly of Native Americans and Tories, gathered again at Three Rivers. The army, under British Commander, Barry St. Leger, was to move down the Mohawk River to the Hudson and there join British forces under General Burgoyne. The British goal was to split the American Colonies along the north-south line of the Hudson River and Lake Champlain and thus destroy the Revolution. This time Christian Herrick's son, Christian, fought against the British as a soldier in the Revolution. But that story is told elsewhere. -----We cruised slowly through the junction at Three Rivers, remembering the historic significance of that place to the history of our country and of our family. We turned northerly into the Oswego Canal and soon passed another historic site, Treasure Island (Stowell Island). French Jesuits had established a mission on the island to convert the surrounding Onondaga Indians and serve the religious needs of colonists. In 1658, they were forced to abandon their mission by the restive Onondaga Indians. According to legend, French colonists buried their gold at the mission when they and the priests abandoned the area. The treasure has never been rediscovered. We searched the muddy banks of island with our eyes, as we cruised past, with the hope of finding an old chest protruding from the silt - but, like many before us, with no success. -----A few miles farther north, after traversing the Fiddler's Elbow, we arrived at the town of Phoenix. Like other sites along the Oswego River, the area that encompasses today's Phoenix was for centuries frequented by Native Americans who spear fished in the river and hunted in the wilderness. The first non-native person to settle in the area was Abram Paddock who built a log cabin on the east shore of the river in 1801. 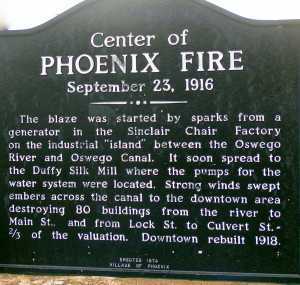 -----Phoenix was originally a point of portage that allowed travelers to avoid the difficult rapids in the Oswego River. The rapids, located just south of the Phoenix Bridge, were known as Three River Rifts. In 1828, the Oswego Canal was completed as far north as Phoenix. The next year Walter Peck erected the first sawmill at Three Rivers Dam. Soon the busy waterway made it possible for canal "spin-off" trades, such as boat-building and lumbering, to flourish. By the 1870s, the village was a manufacturing hub with five boatyards, paper manufacturing companies, chair and furniture factories, a silk mill, and a distillery. 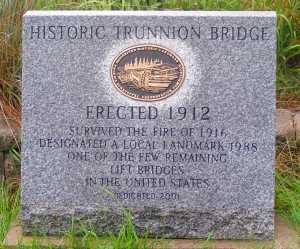 ----- On a quiet September evening In 1916 a fire, ignited by sparks from a generator, swept the town and everything changed overnight for the small, prosperous village. The fire destroyed 80 buildings, two-thirds of the town. Two years later, like Phoenix rising, the town was rebuilt. Hardly any of the manufacturing businesses were restored, although retail establishments were rebuilt by 1918. Today Phoenix is a village of 2,400 with many small businesses and retail stores. 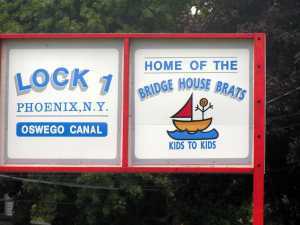 -----Just before entering Lock 1, there are several small white buildings on the east side of the canal and a tall, three-story building built in 1917 - the Bridge House -- to house the original levers and contrrols for a nearby drawbridge. 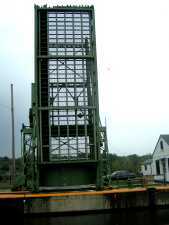 -----The drawbridge, abandoned in the 1980's, is one of the last remaining trunnion drawbridges in the United States. 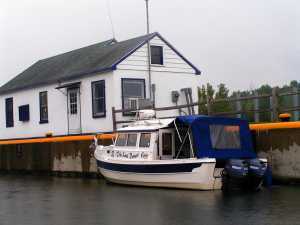 The smaller building, the Buoy House, was built around 1939 to store canal buoys during the winter when the canal was closed. -----Today it is the home of the Bridge House Brats, a group of entrepreneurial 8-21 year olds who serve boaters, during their summer school holidays, with big smiles and efficient assistance. They are known throughout the canal system for their hard work serving boaters, from boat cleaning to errand running. 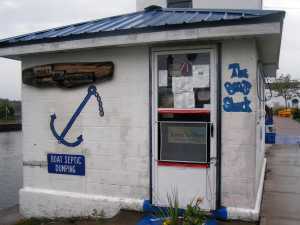 They even have a cook house to serve light meals and snacks to boaters tied off at the Phoenix docks. There is also a small museum in the buildings ,with the remains from the last commercial barge, the Day Peckinpaugh, to travel the Oswego Canal. 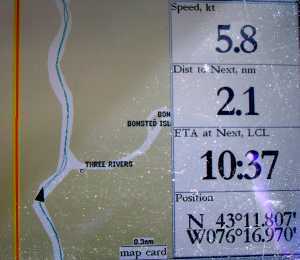 -----Cruising north toward Fulton, you will pass Pathfinder Island on the east side of the channel. 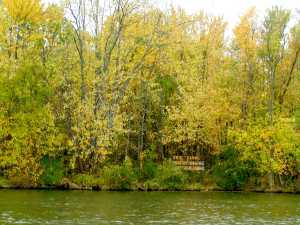 The island was named after the title character in James Fenimore Cooper's "The Path- finder,"one of his Leather-StockingTales. 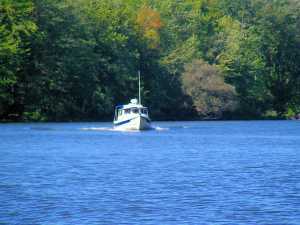 Much of the action in "The Pathfinder" takes place during a trip down the Oswego River in 1759. In fact, the book tells of a fictitious skirmish occurring on this island between the main character in the book, Natty Bumppo, and Huron Indians. The book, published in 1840, was written after Cooper served as a naval officer at Fort Ontario from 1808 to 1809. -----Fulton is the next major town and with a Nestle Chocolate factory in town the odors are a delight to chocoholics. Nearby, is a local spring known as Great Bear. According to Native American legend, one day, as a young brave was getting a drink of water from the springs, he was attacked by a large black bear. There was a struggle, but the brave was victorious. The springs have been called "Great Bear" ever since. -----Native Americans called the area now encompassed by downtown Fulton, Quehok. This was a portage used by Natives to carry their canoes around Oswego Falls. The settlement was called Oswego Falls until 1826, when the name Fulton was chosen. One legend has it that the name came from a coal barge operator who would carry his cargo up the river and call out how much coal was available for sale, usually "FULL TON." Another story, more substantiated, is that the city was named after Robert Fulton, inventor of the steamboat, because of the impact community leaders thought shipping would have on the area. Today, Fulton has a population of about 13,000. 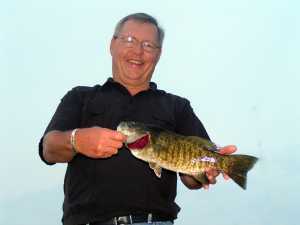 -----There are many state fishing records set from the canal, including a record 47 pound, 13 ounce Chinook salmon in 1991, a 33 pound, 2 ounce brown trout in 1997 and a 33 pound, 7 ounce Coho salmon in 1998. -----Oswego gets its name from the Native American word, "Osh-we-geh," which means "pouring out place." This is a reference to the point where the river waters pour into Lake Ontario. Iroquois Indians lived in the area long before white settlers arrived in the mid-to-late-1600s. The first non-native people here were missionaries, who sought to christianize Native Americans, and British and Dutch traders, who wanted to capitalize on the area¹s rich resources, particularly fur. -----In the 1700s, the British built two forts at the mouth of the river in order to protect interests here. Fort Oswego was built on the west bank and Fort Ontario on the east side of the river. Oswego was the gateway to the Great Lakes and was established as a port in 1725, making it the first freshwater port in the Americas. The British maintained control of Oswego until 1796, well after the American Revolution had been won, in an attempt to make the American government reimburse British loyalists for their property. They had been forced by the new Americans to flee to Canada after the revolution. Though most disagreements between the British and Americans were resolved through the Jay Treaty of 1794, control of Oswego was not transferred to the American government until 1796. -----In the mid-1800's, Edward Austin Sheldon, an educator, also made a mark on Oswego and the nation. Sheldon, who was the city's first superintendent of schools, initiated a new method and philosophy of teaching. The method, called "object teaching," requires students to make their own discoveries, instead of learning by rote. It was sometimes referred to as the "Oswego Method." Sheldon founded the Oswego Normal School in 1861; five years later the school was part of the New York State System. Today, the State University of New York at Oswego, with its roots in the Oswego School, offers arts and science undergraduate and graduate programs to about 9,000 students. ----- Salt mines were opened in the Midwest in the 1870's spelling the end of Oswego's bustling port; shipments of salt from Syracuse were no longer needed there. The charging of tolls on the Erie Canal ended, making the Erie a more cost-effective transportation route. The Welland Canal in Ontario, Canada, which provided a route from Lake Ontario to Lake Erie around Niagara Falls, was no longer wide enough for newer, larger boats to travel through. Oswego was no longer used as the main transfer port to the Midwest from the east coast. In 1870, approximately 900,000 tons of freight were shipped on the Oswego Canal; by 1900, this was reduced to about 30,000 tons. ----- This city holds a little known secret. In 1944, 982 refugees fleeing Nazi persecution were relocated to Fort Ontario in Oswego. Known as "Safe Haven," this was the only site in the United States to house Holocaust survivors. The refugees were from 18 countries and had traveled from Italy to New York Harbor by ship, then by train to Oswego. This camp gave the refugees tools of the trade, teaching the men woodworking skills and the women hairdressing, while giving them English lessons and allowing their children to attend nearby Oswego schools. An exhibit and video memorializing this site & its history are on display at Fort Ontario Park and is open to the public. The exhibit features photos, reproductions of documents and memorabilia. ----- To the north of town is the harbor's breakwall and lighthouse. The lighthouse was added onto the breakwall in 1934. But don't stray too close--ghostly tales abound about it! 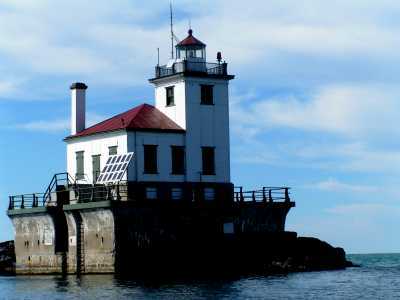 The light was originally kept burning by the U.S. Coast Guard. During an early winter storm in 1942, eight Coast Guardsmen set out for the lighthouse, hoping to bring back the lighthouse keeper who had been stranded in the building for several days because of the storm. After putting a new keeper on watch, the men turned their boat toward shore. Before they could move away, a sudden swell smashed their boat against the building's foundation. Six of the eight men drowned. Ever since, mysterious voices and footsteps have been heard in the lighthouse. Light bulbs frequently become unscrewed. And most perplexing of all, lights are seen coming from all windows in the building, even those covered with thick steel plates. In 1968, the lighthouse was automated. 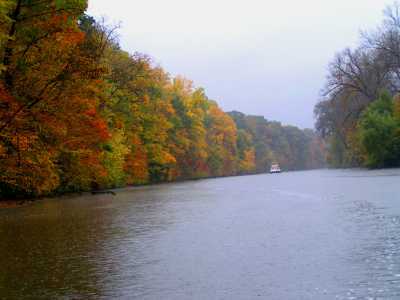 -----Traveling along the Oswego Canal is similar it is a delight to visit the various towns and communities. Just as along the Erie canal, these towns feature a diverse range of architectural styles, reflective of the times and period tastes. If you feel like stretching your legs for a stroll, you can find examples of Federal Style (1800-1840), Greek Revival (1830-1860), Italianate (1850-1880) and Second Empire Style (1860-1880). Searching them out makes a great quest (and good exercise off the boat). 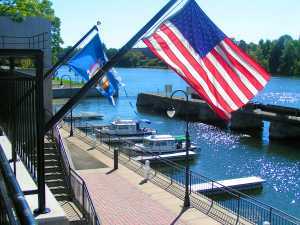 -----There are also interesting events sponsored by Oswego canal towns, with the Oswego Harborfest in July perhaps the biggest draw. Thousands of people each year attend and the event boasts one of the best fireworks displays along the Canal.